So, you have a long layover in Beijing, China? If you’re anything like me, you hate waiting in an airport. Luckily, there are heaps of different companies that offer Beijing layover tours ranging from 5-12+ hours in length. The price and what is included depends on the company, and the length of your tour. My best advice is do your RESEARCH and read previous reviews about that company before booking anything. Read the fine print on what is and isn’t included! I found www.beijinglayovertour.com while searching Google. Out of all of the companies I researched, they were the most reasonably priced. They included a English-speaking guide with a private vehicle, a coat (Chinese police trench coats) if it is cold, and tourist insurance. Some companies will charge you an additional $100+ USD for an English-speaking guide. The company also provided a letter for you to give to the Chinese Customs to help make the process smoother. Saving money is what every traveler loves to do. That’s why doing a Beijing layover tour is perfect for someone who wants to see China but has a limited amount of time. You get to go through the “72-hour visa” line absolutely free. This means a FREE VISA for China. Normally they are $140.00 USD for a single entry, 3-month visa. We paid $110 USD deposit when booking (Paypal), and then paid the remaining balance of $110 USD when the tour was over. This price doesn’t include the Cable car or toboggan at the Great Wall ($16USD), meals, or gratuities (we tipped our driver and tour guide roughly $35USD). The itinerary is completely customized for you, and how long your layover is. We arrived at 6am to the Beijing airport, after an overnight flight from Phuket, Thailand. Tired and groggy we made our way to Chinese customs. The line for the “72-hour visa” is pretty easy to find, and at that time of morning, not many people are waiting in line. We got up to the booth and handed our passports and letters over to the officer. Unfortunately, we had filled out the immigration cards incorrectly. She handed them back to us while we correctly filled them out. I don’t know why, but I always get so nervous going thru customs. Thankfully she was being nice about it. Finally, after our second attempt, she granted us our stamps, and out we went… We made our way downstairs to the terminal 2 arrival hall, and found the Starbucks that our tour guide was meeting us at. At 8:30 am on the dot our guide, Daniel, arrived. He was super friendly and lead us to our private vehicle that was waiting. It was about an hour and a half drive to the Great Wall- Mutianyu. During that drive Daniel told us some history about China and the Great Wall. The Great Wall of China, dates to the third century B.C., and is full of history. You might be intrigued to know that the wall stretches for over 5,500 miles. There are a lot of different sections along the wall where you can go and explore. The Great Wall of China- Badaling is the most visited section. However, 70 km from Beijing is the Great Wall of China- Mutianyu. This section is less visited than other sections and has the ski lift and toboggan. Once at the Great Wall of China’s parking lot, we stared up into the mountains in amazement. Did I mention it was freaking freezing there? Luckily, our tour guide saved the day, providing us with the warmest Chinese Police jackets. After getting geared up, we were ready to make the trek up. Just kidding, we took the dodgy ski lift to the top. Being raised in Texas, I have never been on a ski lift, but this one seemed like it was built in like the early 1900’s. Anyways, we made it up to the top after a minute or two of breathtaking views. Once to the top of the Great Wall, we stood there such in awe and disbelief that humans could actually build such a thing. Since we got there early, we were literally the first people to go up. It was so magical being able to have the whole wall to ourselves. We only saw two workers for the first hour we were there. Then towards the end, a couple of people trickled in, but only about a dozen or so. In my opinion two hours was a decent amount of time to spend walking around the wall. Before we knew it, time was up. Our tour guide told us to make sure not to be late, because we didn’t want to jeopardize missing our flight. Therefore, we opted for the fasted option down the wall, the TOBOGGAN! This was by far one of the highlights of our trip, other than of course just stepping foot onto the Great Wall of China. For only $8 USD, you take a two-and-a-half-minute ride of a lifetime. We just so happened to have the smart idea to Go-Pro the ride. If you ask a lot of travelers, no one really knows about the toboggan at the Great Wall. That is why we are sharing our experience with you. Our video has recently been viewed over 50+ million times and shared by hundreds of thousands of people around the world. We accomplished a lot in a short amount of time during this trip. We crossed the Great Wall of China off our super long bucket list and got to ride a crazy toboggan down the wall. On top of it all, hopefully we have inspired millions of everyday people to put this awesome activity on their bucket list. Not having to sit in the Beijing airport! A FREE 72-hour transit visa for China. 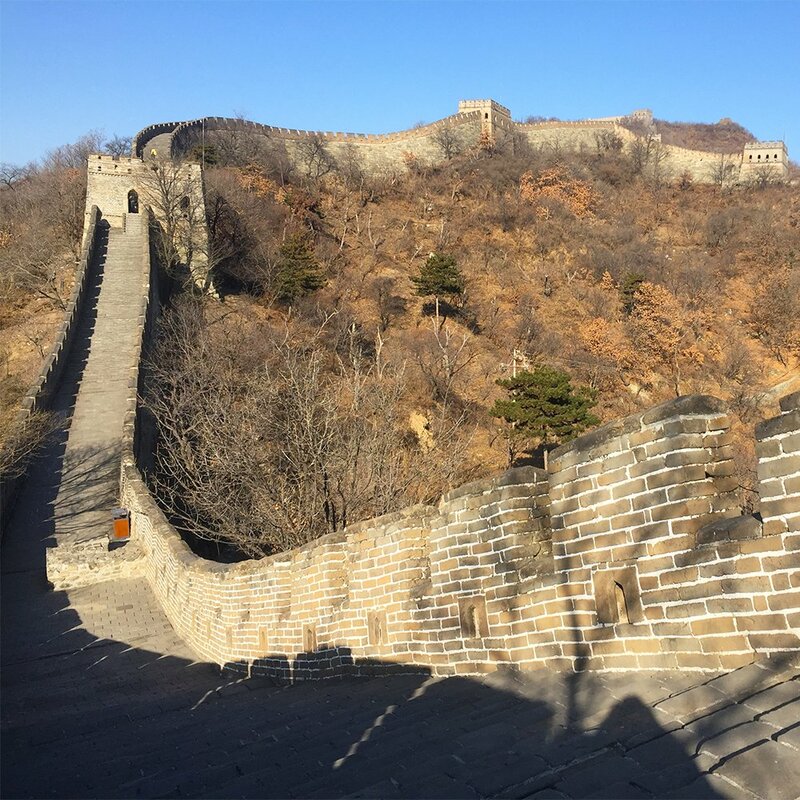 Getting to cross the Great Wall of China off your bucket list. You will be able to say you’re a “Hero” since you have stepped foot on the Great Wall of China. You will get to ask your tour guide any questions you have about China. Learning the history behind China and the Great Wall. It was freezing, but luckily our tour guide gave us Chinese Police jackets! Sometimes they shut the toboggan down, so it’s a hit or miss. We got lucky, because the day before they had it closed due to snow. The chair lift doesn’t stop while getting on or off. Plus, it did not seem the safest, but better than having to walk up if you don’t have the time. Make sure to check the weather, and dress accordingly. Remember to get Chinese currency before you get to China. They don’t accept any foreign credit/debit cards except at ATM’s. Purchases must be made in their currency. Take a bottle of water with you. After walking around for a couple of hours in high altitude, you get dry mouthed. There is Wi-Fi in the airport and the restaurant near the Great Wall. However, over 300 popular websites are banned and censored by the Chinese government. Some of these include Facebook, Instagram, Snap Chat, and other popular social media sites. For some weird reason, we were able to connect on Facebook Messenger while at the Beijing airport. So be prepared to be mostly off the grid for the day.